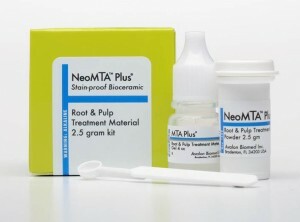 NeoMTA™ Plus® root and pulp treatment material is a powder/gel system with no resin. The components are an extremely fine powder primarily tricalcium and dicalcium silicate plus a water-based gel. The powder is off-white, contains no bismuth oxide, and is formulated to prevent staining the tooth. 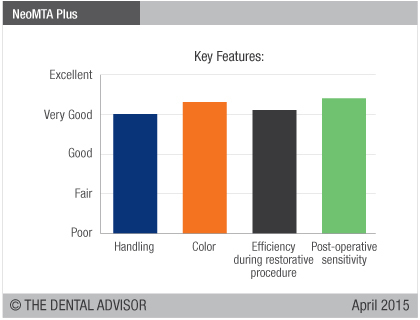 The material is both bioactive and radiopaque and is indicated for pulp capping, cavity lining, base, pulpotomy, root-end filling, apexification, perforation repair, root resorption, sealing, and endodontic obturation. 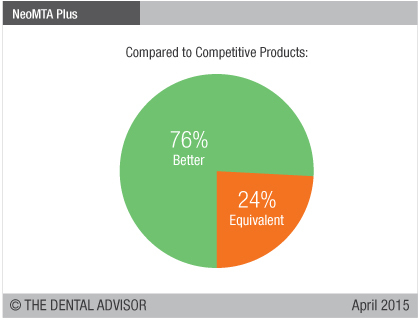 NeoMTA Plus achieves washout resistance in less than 3 minutes, allowing continuation of the restorative procedure. It has a 20-minute working time and a 50-minute setting time when mixed to a putty consistency. The powder bottle has a desiccant liner, allowing a shelf life of 3 years; storage is at room temperature. The kit evaluated included 2.5 g powder with scoop and 4 mL liquid in a dropper bottle. 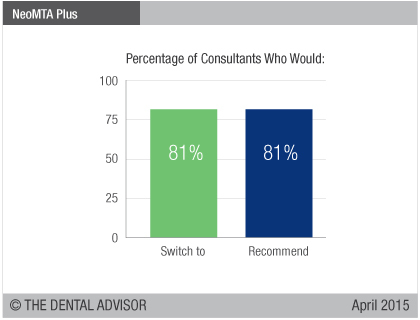 NeoMTA Plus was evaluated by 21 consultants in 357 uses. 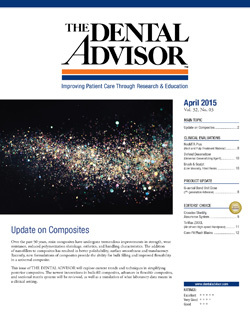 This reparative cement received a 91% clinical rating.